Doug Lyon started curling in 1947 in Wolseley, Saskatchewan. Since then he has been a member of the Highland Curling Club in Regina and the Gull Lake Curling Club. In 1965 He moved to Melfort and has been an active member of the Melfort Curling Club ever since. Doug has been a member of the Melfort Curling Club executive for many years and was instrumental in designing and leading the construction of the interior of the Melfort Curling rink. He has been involved in most of the Playdowns that have been held in Melfort and he was the Chair of the first Wheat Pool Tankard to be held in the Northern Lights Palace in 1995. Over the past many years Doug has worked tirelessly in any capacity that was required to ensure the success of the curling club. Doug was also involved with coaching many High School Curling Teams during his career as a Teacher in Melfort. 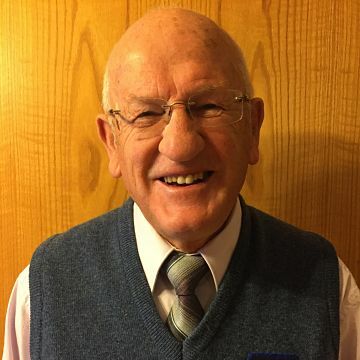 Doug’s competitive career included curling in the Southern Brier Playdowns, curling third for Gene Grimes in about 1963 when he lived in Gull Lake. He also curled in the Provincial Mixed three times with Orlo Coverette in the 70’s. He curled in the Provincial Masters with Wayne Garinger, losing the Provincial Final to Benno Korte in 1991. Roy Thiessen, a teacher and coach from Moose Jaw claims that Doug may be the first person to deliver a curling rock with a no lift delivery. This came about when Doug hurt his back and realized that he had to either push the rock or quit the sport that he truly loved. He decided to go with the no lift delivery. One could say that Doug Lyon revolutionized the game of curling. When Doug looks back on his curling career three highlights come to mind. First and foremost is the friends that he has made and the comradery that he has experienced throughout the curling community. His next highlight is being named Chair of the 1995 Provincial Tankard and claims the success of the event was due to the group that he had helping him and takes no credit. His third highlight was curling with his two brothers and a cousin in the Melfort Seniors Bonspiel a few years ago.